NEW point to point emulation with Critical Link allows you to link directly to a PLC! Status wireless transmitters are designed to work in harsh industrial environments. The weather tight enclosure is sealed with an O-ring and screw on cover. 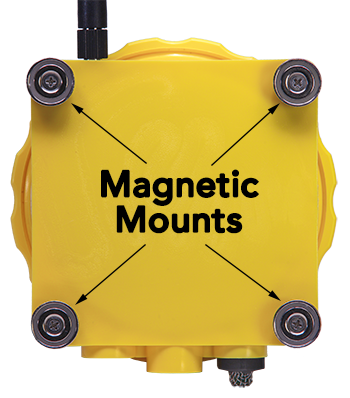 They come with powerful magnetic mounts for easy installation and the flanged enclosure can also be permanently mounted with screws. The rugged 900 MHz proprietary wireless protocol ensures that your data will be received and that other communications will not be affected. Battery life approaches 2 years for the standard AA batteries. The screw-on cover does not require tools so battery replacement is simple and easy. Open field range can be up to 1200 feet. Each wireless transmitter can manage up to 3 sensors. They are pre-configured to your specification at the factory. Type K thermocouple, analog voltage or 4-20 ma (PST-CL-A) and discrete input (PST-CL-D) options available. Pair up a transmitter with a CL Receiver to get a 4-20 mA output signal that is proportional to the transmitter’s input. Connect directly to your PLC’s analog input. No software is necessary, but it can still be used to monitor and log data. The CL Receiver requires 13-40 VDC power. The PST-TCK thermocouple transmitter has sockets for 3 type K inputs. Monitor conditions in server rooms, ovens freezers, refrigerators, warehouses and any environment where temperature can have an impact on safety, reliability or product quality. Less than $200.0 per data point. The PST-THD environmental sensor measures air temperature, humidity and dewpoint. It monitors conditions inside rooms, server rooms, freezers, refrigerators, warehouses and any environment where air quality can have an impact on safety, reliablity or product quality. The PST-AC1 current sensor measures AC current to detect abnormal loading conditions or audit energy usage. Uses a split core transducer. 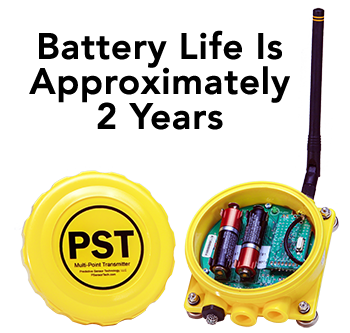 The PST-D01 discrete sensor monitors the state, count and frequency of a dry switch contact. The count is the total number of contact closures since the last reset (totalizer). The frequency is measured in Hz and is useful for flow meters and other devices that output a proportional frequency. The state is either open or closed. All discrete sensors can deal with voltages up to 24 VDC. The PST-DRC discrete sensor monitors the dwell time, switch rate in changes/hour and total count of switch changes. The PST-CL-D discrete sensor monitors up to 3 discrete points and emulates their state at the receiver end. Uses Critical Link protocol. This is a matched pair that is designed to snap right into a PLC system. 3 Dry contacts on the receiver end. *The frequency can be increased to 10 kHz. The 400 Hz limitation was added to remove switch bounce. The PST-V01 vibration sensor measures velocity. Magnetic mounts for the sensor and transmitter make this fully wireless sensor a very effective maintenance tool. Sensor can be triggered to sample at a specific time or sample at timed intervals.